As department stores, specialty stores and big box retailers retrench, discount chains are growing. Ross (ROST), a clothing and home decor chain, recently opened 30 stores and plans to add 70 more this year. It's aiming for 2,500 stores eventually, up from about 1,500 today. TJX Companies (TJX), the parent of TJ Maxx, Marshalls, and HomeGoods, is opening 238 stores this year, and Burlington Stores (BURL) is opening up to 40. The discounters, also known as off-price sellers, are expanding their physical footprints, even as Americans shop more online and most brick-and-mortar retailers pour cash into their digital operations. During an era of disruption, these companies have proved resilient — and durable against competition from Amazon. Ross, which doesn't have a digital shop, relies on a flexible purchasing strategy to offer top brands at bargain prices, enticing shoppers to head to stores to find clothes they can't buy online. The average item is only $10, and 98% of the stuff in its store is under $30. "The place that Ross and TJX occupy is a place that's tough to do online," said Simeon Siegel, a retail analyst at Nomura Group. "I believe Ross is winning because it doesn't have e-commerce, not in spite of it." Ross racked up more than $14 billion in sales last year, second only to TJX in its category. It has recorded 13 consecutive years of growth at stores open at least a year, outpacing Macy's (M), JCPenney (JCP), and Nordstrom (JWN). Ross stores offer a mix of name-brand and designer apparel and home fashion for 20% to 60% less than department and specialty stores. When brands produce too many clothes or department stores cancel orders, Ross and other discounters step in and buy the leftover inventory. Ross calls them "opportunistic purchases." It can either quickly ship the product to shelves to meet in-season looks or pack the products away in warehouses to sell later. Both methods help the company constantly rotate through a wide assortment of styles and fashions. "The one certainty in fashion is that brands will make mistakes and overcreate," Nomura's Siegel said. "There will always be a role for someone willing to absorb those mistakes." The growth of online shopping may be accelerating the clothing glut by creating more customer returns. In addition, clothing brands place orders months in advance and have to forecast volatile factors like consumer spending power, weather, commodity costs, and tariffs to make their purchases. Discounters like Ross have much shorter lead times — often late in the season when fashion trends have already been well established. "They can be more nimble reacting to what customers want," said Moody's senior retail analyst Christina Boni. 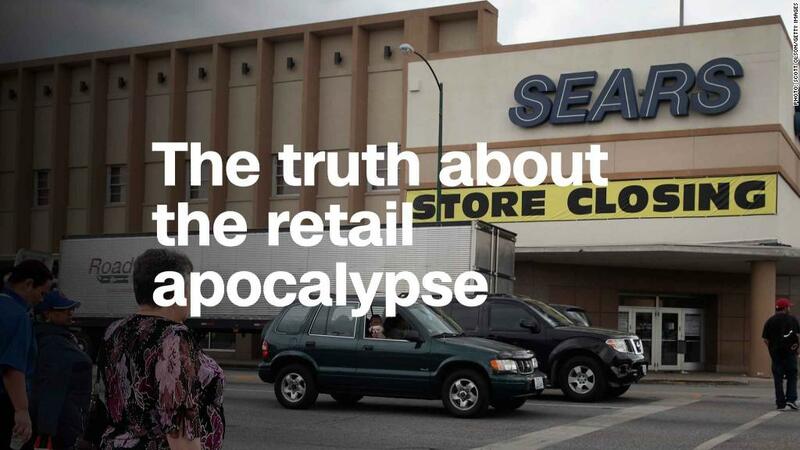 The business model "reduces fashion and markdown risks that other apparel retailers face." Brands and retail stores are expanding online and focusing on improving in-store amenities. By contrast, Ross offers a "treasure-hunt shopping experience that cannot be replicated online," said Betty Chen, Ross' director of investor and media relations. Related: 700 empty Toys 'R' Us stores. Who's going to fill them? Stores are a single floor, laid out neatly and predictably, to make it easy for shoppers to identify sections and find their sizes. Brian Hertz, a 29-year-old sustainability consultant in Houston, shops with his wife, Jennifer, a kindergarten teacher, at their local Marshalls and TJMaxx. The couple spends $20 to $30 a trip. "It's a good place to get team gear relatively cheap," he said. "I can also find Polo shirts there for about the same price as the factory store, but much closer to home." Hertz and his wife often go to browse the shelves, which helps them make purchasing decisions: "Sometimes we find things that we have thought about buying, but didn't think to get it there," he said. "The thing about Amazon is that you have to know what you're looking for." 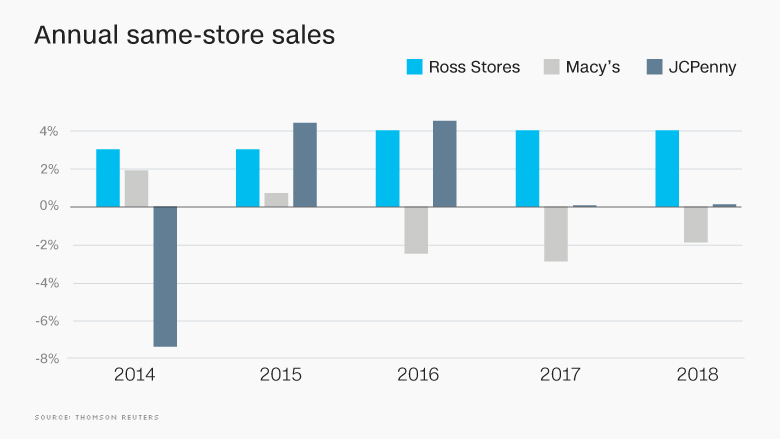 Ross serves a range of household incomes — Americans who "want a bargain" and those who "need a bargain," the company said in a May investor presentation. The average household income for Ross customers is $63,000 a year, according to an off-price sector report set to be released by retail think tank Coresight Research in early August. Amazon shoppers' average household income is $85,000. The off-price sector has shown strength during recessions, when consumers look to trade down for purchases, and also during growth periods. Despite a healthy economy and a recovery in many Americans' discretionary income since the 2008 recession, widening inequality has created a base of Ross' low and middle-income core shoppers, said John Mercer, a senior analyst at Coresight. Mercer also attributed discounters' rise to financially squeezed younger shoppers. In fact, Millennials have the strongest affinity of any age group to off-price retailers, a December Cowen survey found. "There's no stigma in shopping off-price anymore," Nomura's Siegel said. "Whether it's a sign of the times, a Millennial desire, or great marketing by TJ and their fashionista, off-price is more than expected — it's appreciated." Wall Street believes off-pricers have skillfully defended their turf against Amazon: Stocks of all three companies have surged over the past year. Siegel argued Ross is also protected against Amazon because two-thirds of the business is handled with cash or debit. Ross has argued that the high costs of online shipping and frequent return rates mean it doesn't make sense for Amazon to attack heavy-discount apparel sellers. "The economics just don't work," Ross' president and chief operating officer, Michael O'Sullivan, told Goldman Sachs analysts last year. "If I was Amazon, I don't think I'd be looking at the off-price space as my big opportunity." Amazon may have reached a similar conclusion. Analysts see the company operating in clothing as more of a traditional department store rather than an off-pricer. "Amazon looks to be shifting its focus away from cut-price, third-party-branded offerings with the launch of many more private labels and stronger relationships with brands," Coresight's Mercer said. — Correction: A previous version of this article gave an incorrect title for Michael O'Sullivan, the president and chief operating officer of Ross.